Premise- One contestant on the show plays for a beneficiary (usually a friend or family member) whom they feel deserves the money the most. The contestant will play a total of five rounds of guessing what the mystery “Who”, “What”, or “Where” subject is based on a series clues. The first round has a starting bank of $10,000, round two starting at $25,000, round three starting at $25,000, round four starting at $50,000, and round five starting at $100,000. The bank for each round is divided into nine increasing dollar values. A maximum of nine clues are hidden on the board as well as the nine hidden dollar values. In each round, the contestant is given one free clue. In order for a contestant to get additional clues to help them guess the subject, they must purchase the clue by picking one of the cards numbered from one through nine, with each card hiding a different dollar value. After the dollar value is revealed, it is subtracted from the bank in the round and the clue is revealed. The player may guess the subject at any time, but can only guess once. If they make the right guess, the remaining total left in the bank is added to their total winnings. If they make the wrong guess, they lose the remaining bank money and no money is added to their total. At the end of the show, the contestant’s beneficiary is surprised with the news that the contestant’s total winnings will be given to them as a surprise gift. I have read multiple reviews including TV Guide’s and Buzzerblog’s reviews saying that the show was either good to watch or basically a waste of television time. In my opinion, I think that You Deserve It is a decent game show. The first thing I noticed about ABC’s new game show was that the gameplay is essentially a hybrid of Deal or No Deal and the puzzle round in the 80’s version of Break The Bank. Even though the puzzles and clues are challenging, the gameplay is decent and passable, but repetitive, even though it rips off Deal or No Deal a little and ignoring the fact that this show was made by the producers of Deal or No Deal. However, I do like that the contestant is only allowed one guess per round and that no lifelines are used on the show. You Deserve It is a purely emotional-driven show, from the opening video montage about the beneficiary’s troubling situation on why they deserve the money, to the support of the family on-stage, and even down to surprising the beneficiary with the good news of their new found wealth. Chris Harrison does a good job serving as the dual role as a confidant/counselor and a game show host. Of course, Harrison is no stranger to hosting as he is currently hosting The Bachelor on ABC and has hosted a GSN original game show called Mall Masters. Although he does a good job carrying the show, he could do a better job conversing with the on-stage supporting family more. With Harrison on constant connection with the family often, like Howie Mandel did on Deal or No Deal, it seems like the family support being there is not adding much to the show and they were the just to fill the space on the stage. In my opinion, I think the supporting family members on-stage are better off just sitting in the front row with the studio audience. Overall, based on the show’s premise and objective, You Deserve It does a good job of equally distributing the gameplay and emotional aspects of the show. The only minor problem I have with the show is the lack of variety with the gameplay. 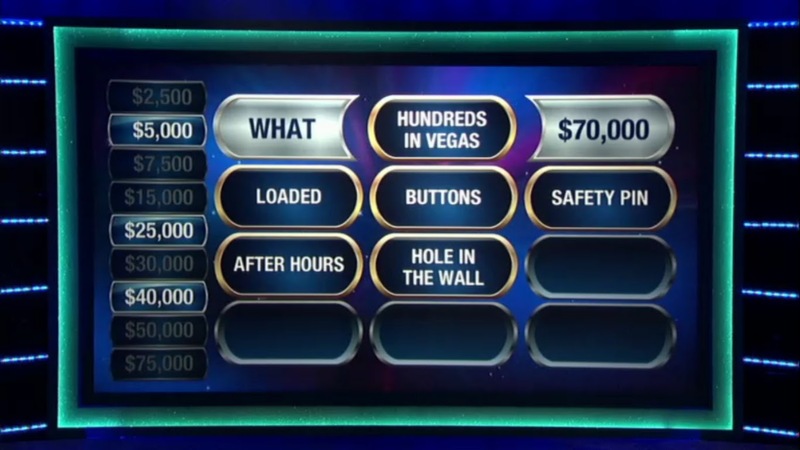 The show should add different types of games for their rounds, like unscrambling words or even solving a Wheel of Fortune-style puzzle, and regularly keeping the games in rotation to avoid stagnation in the gameplay. It’s a “feel-good” game show without the producers overproducing the show and getting annoying with the emotional aspect like Deal or No Deal has done in the past. Watch You Deserve It! Mondays at 9:00p.m. EST on ABC! Super fantastic and amazing review. Really great sharing. Thanks.